Do all religions basically teach the same thing? How can we say 'no' if we don't know what the other religions actually teach?! Click To Tweet I cannot count the number of times that I’ve had someone tell me that “all religions basically teach the same thing.” Really?! Do they? This is a difficult assertion to refute if you don’t actually know what other religions teach. 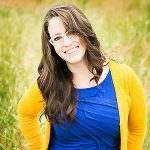 When I met Lindsey Medenwaldt, I was ecstatic to learn that her passion was understanding world religions! Here is an interview with Lindsey, and a preview of what is coming this year on Mama Bear Apologetics! 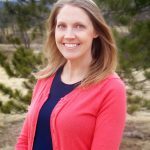 MBA: Welcome Lindsey! 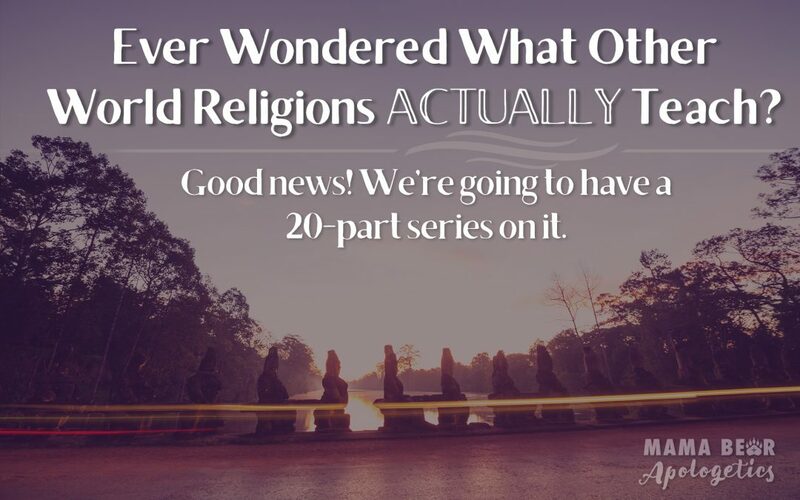 Tell us about the new World Religions series on Mama Bear! LM: I’m thrilled about this opportunity! I have had the unique opportunity to study this in college, but I hear a lot of other moms saying stuff like, “When am I going to have time to learn about that between kids, chores, work, and all of the other stuff I need to take care of?” I just want to serve out of the gifts that the Lord has given me. I hope they will be as excited about this new world religions series on the Mama Bear Apologetics Blog as I am! MBA: Well I know WE are! What all will you be covering? LM: We’ll be covering ten major (or well-known) world religions: Judaism, Jehovah’s Witness, Islam, Bahai, Hinduism, Scientology, Mormonism, Buddhism, Christian Science and Oprah-ism, which is basically a “choose your own religion.” We’ll have two articles per religion. The first will focus on similarities and differences between the world religion and Christianity. The second will be in a “frequently asked questions” format and will deal with the most common questions kids have about the other religion. Ideally, it will give Mama Bears a quick (and thorough) reference source. They probably won’t be experts after reading this series, but it will be a good introduction. MBA: What do you think will be unique about the way you present these topics on Mama Bear Apologetics? MBA: What suggestions can you make for Mama Bears to get the most out of the series? LM: It really depends on the Mama Bear. Some of them will really enjoy the quick reference chart comparing Christianity with the other religion. Others will find themselves engrossed in the details. Maybe they know members of the other religion we’re covering. Maybe they came out of that religion, or they have seen something on social media that sparked their interest. I think most Mama Bears will really enjoy the question and answer article for each religion because it will contain specific questions that their kids may have regarding the religion. For example, in the Judaism question and answer, we’ll talk about things like why Jewish men wear yarmulkes, what a bar mitzvah is, and what Jews think about Christmas. We’ll also cover serious questions about the religion, like the supposed “blood curse” in Matthew 27:25. I have heard stories from Jewish people about Christian kids calling them “Christ-killers” when they were growing up. That is not okay. Things like that are better addressed sooner rather than later. We’ll also suggest questions that you can ask people from the religion we’re covering to open doors for conversation. Why do you think it’s so important for Mama Bears to understand world religions? MBA: What drew you to studying world religions? LM: It’s a bit of a long story. I was raised in a conservative, Christian home, and I have the double-whammy of being both a PK (pastor kid) and MK (missionary kid). I don’t say that to be disparaging toward PKs/MKs or to imply that my experience was negative, but to give you some context. I became a Christian at a very young age (around 5), and my dad baptized me at age 8. When I went to college, I didn’t really give any thought to my faith—it was just part of who I was. I never thought I’d be challenged for my beliefs because I always assumed that Christianity was right and other religions were wrong. I grew up in a very small Christian bubble, and most of my friends before college were Christians. During my senior year, a professor in my degree program asked if I was interested in doing an independent study with him about world religion/philosophy. I’m pretty sure he knew I was a Christian, and I think he was hoping to challenge my faith (he was an atheist). I thought the independent study sounded interesting, but I was warned by other Christians that the class could open me up to doubt and was told that I shouldn’t take it. MBA: Can we talk about that for a second? Were you worried about doubt? LM: Great question. I’ve always known that doubt is normal and expected in life. Just because someone has doubts doesn’t necessarily mean they will leave the Christian faith. That said, the people who warned me were correct—this class could have opened up the door to me leaving Christianity because I didn’t already have a strong apologetic background. Honestly, I couldn’t really answer the question about why I believed what I believed. I think part of the reason it didn’t end badly was that I was intent on learning about other religions without dabbling in them. MBA: So, tell me about the class. LM: I quickly realized that I was in over my head. Having had virtually no exposure to other religions, I was intrigued by everything I read. I read the Bhagavad-Gita (a Hindu text), the Art of War (ancient Chinese literature), as well as parts of the Quran (the holy book of Islam) and the Book of Mormon. I even read some books about mysticism and magic so that I could get a wide range of different worldviews. I tried meditation once, which resulted in candle wax stains on my clothes because I attempted to meditate in the darkness of my closet. Oops! It was also during this time that I started asking others about what they believed. MBA: Where did those conversations lead? LM: At this point, I was openly exploring all faiths and what they taught. I could not get enough of it. I found myself going to the bookstore and buying books on religion. I bought a copy of Fritz Ridenour’s book, So What’s the Difference, and I read it cover-to-cover. Instead of shaking my faith as some had warned, this class and the research that came from it strengthened the foundation of my faith. However, this experience could have easily gone the other way, especially if I had started my journey because I was dissatisfied with Christianity. That is why I am so passionate about teaching people about other worldviews. Done well, it is truly a faith-building exercise. Done poorly. . . not so much. I realized through this independent study that I had previously thought my personal Christian faith was built on a rock, but really, I didn’t have much of a secure foundation at all. I was standing firm on the Word of God, but I didn’t know why. I now know why I believe what I believe, and I can articulate what other people believe as well. MBA: Before we wrap up, can you tell me a little bit about yourself so that our Mama Bears can get to know you better? LM: Sure! 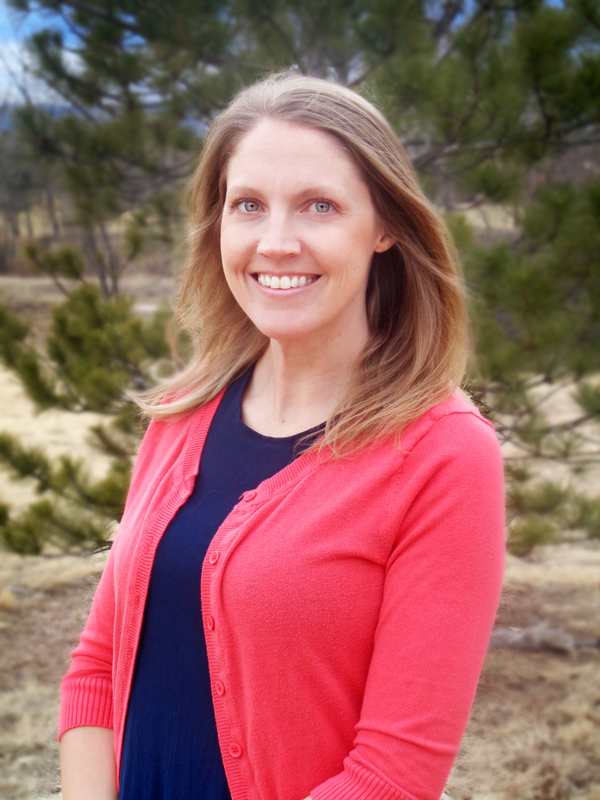 I am currently pursuing a master’s degree in apologetics and ethics at Denver Seminary. I am the only woman in my program, which is why both Mama Bear and Women in Apologetics have been such a breath of fresh air. I also have a Bachelor’s in mass communication, a Master’s of Public Administration, and a law degree (J.D.). For fun, I love to read, go to the movies, and bake. I have been married to my husband, Jay, for 11 years. He’s also an apologist, and actually came to the Christian faith because of apologetics nearly 13 years ago. He is currently pursuing a M.Div. in apologetics and the New Testament from Denver Seminary. After that, he plans to get his Th.M. He has founded two ministries in the past five years: Christianity for Everyone (C4E) and Apologetics Awareness. I am the Mama Bear of three wonderful daughters, ages 10, 7, and 4. One priority Jay and I have as parents is that we try to teach our children apologetic arguments at a simple level so that their Christian foundation is firm. So far, they have a child’s level grasp of the Kalam Cosmological Argument and the Moral Argument. MBA: Oooh! You’ll have to tell us about that at another time! LM: Absolutely! And I just have to add one more thing. Joining Mama Bears has been a direct answer to prayer for me, and I’m excited to join other women who are intensely passionate about rising up and sharing truth with our children. MBA: Well, we are so happy to have you Lindsey! We are looking forward to this upcoming series. i hope i haven’t missed this series! please let me know when and where i can get it. Just sign up! We send out an email every 2 weeks to talk about what is new!